The Cleveland Cavaliers of the NBA are now the best paid team in global sport according to Sportingintelligence’s Global Sports Salaries Survey (GSSS) for 2016, to be published in full tomorrow, and with key extracts in today’s Mail on Sunday (links below). The average first-team pay at the Cavaliers, home to NBA icon LeBron James, is £6.54m per year ($8.7m), or £125,883 per week in the 2016-17 season that commenced on 25 October. A huge new TV deal in the NBA as well as the effects of Brexit on the dollar-pound exchange rate have combined to take a wrecking ball to the upper echelons of the GSSS, with NBA teams surging up the list en masse. Last year there were eight football teams in the GSSS top 10. This year there are seven NBA teams in the top 10 including the Cavaliers at No1, and the LA Clippers at No3, separated by another US-based sports team, baseball’s New York Yankees, at No2. There are 14 NBA teams in the top 20, up from five in the GSSS 2015. Manchester United of the Premier League have climbed from No6 in the last GSSS to No4 on the new list to become the highest ranked football team, and best paid football team in the world. This is the first time in the GSSS’s seven-year existence that United’s average first-team pay has outstripped every other football club. A mammoth summer of transfer spending and the hiring of big names including Paul Pogba and Zlatan Ibrahimovic has made an already rich squad even more costly to service, and United’s average basic first-team pay in 2016-17 has been calculated at £5.77m a year or £110,962 a week. This puts United ahead of Barcelona, who are the second highest paid football team (and No6 overall, on £5.65m a year) and ahead of their local rivals, Manchester City, who are No3 among football teams and No9 on the overall list with average pay of £5.4m a year. Among the top dozen teams (left, click to enlarge), only United, Barca and City come from the world of football while eight are from the NBA, and the Yankees are from baseball. Eight of the 12 top payers are based in the USA, two in England, one in Spain, and one in Canada – the NBA’s Toronto Raptors. Last year, five Premier League football teams made the top 20; this year only United and City make the top 30, with only Chelsea at No34 even making the top 40, Arsenal at No47 added in the top 50, and Liverpool at No60making the top 60. This does not mean the Premier League is enduring any kind of hardship – far from it. New TV deals in England’s top division means wages are generally rising across the division, to different extents but especially among the lesser teams. Average basic annual pay in the Premier League in 2016-17 is more than £2.4m per player, or almost twice as much as pay in the second highest paying league in the world, Spain’s La Liga. But the astonishing pay hikes in the NBA – of almost $2m per player per year on average – as well as the dollar-pound activity, mean NBA and MLB teams are preeminent in the upper reaches of the list. The rise of the NBA teams is explored in this piece, while United’s status as the best paying team in football is explored here. Notable in global sport in 2016 has been a huge splurge by clubs in the Chinese Super League on players and wages, covered further here. A feature comparing the world’s best paid sports league, the NBA, with the world’s best paid football league, the Premier League (wages, stars, attendance, prices, competitive balance), can be found here. 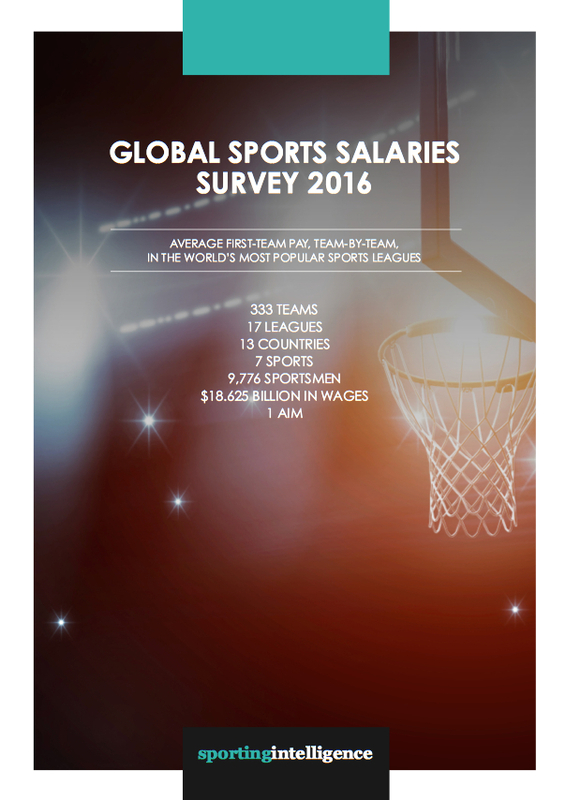 The full 54-page GSSS 2016 is will be available free as a PDF download from our global sports salaries microsite from Monday 14 November. Requests for copies to be emailed and / or a copy of the key findings in spreadsheet form can made by email; put ‘GSSS 2016′ in the subject line. There have been significant movers around the list for different reasons. Last year’s No1 team, PSG, are as low as No35 this time, partly due to their own average salaries falling, partly due to being overtaken by so many teams from North America. Last year’s No2 team, Real Madrid, are as low No19 this time despite despite wages going up at the Bernabeu. Manchester City were No3 last year and are down to No9 despite pay hikes, again because of the rise of the NBA. Barcelona drop one place from No4 to No5 while last year’s No5 team, the LA Dodgers of MLB, are down at No26 this time. Arguably one of the biggest surprise fallers are the Brooklyn Nets of the NBA, down from No11 to No53. The riches swilling around US basketball are not getting spent on salaries for Nets stars, where average first-team pay has fallen from $6.2m a year in GSSS 2015 to $4.6m now. Back with football, the best paid team in Germany, Bayern Munich, have fallen from No7 to No37, while the richest in Italy, Juventus, have dropped from No24 to No41. The GSSS looks solely at earnings for playing sport, not for endorsements or other extra-curricular activities. It considers 333 teams in 17 leagues across 13 countries in seven sports: football, baseball, basketball, gridiron, cricket, ice hockey and Australian Rules football. The NBA is the highest-paying league as a whole, with 449 players at 30 teams in the 2016-17 season earning an average of $6.4m per year each. (The £ sterling values for leagues paid in $ were converted at the rates applicable on the Monday after the Brexit vote in June, and in the run-up to the current seasons. For consistency, all conversions from pounds, various dollars, euros, yen and yuan were made on the same day last year into pounds £ and $US; full details are in the full GSSS 2016). The Premier League is the best paying football league in the world, with average annual basic pay at just above £2.4m per player. The salaries report features salary information for the most popular professional domestic sports leagues in the world, by average attendance per game, for which we have been able to obtain reliable data, as well as various other leagues from the worlds most popular sport, football. The 17 leagues are, in order of highest to lowest average salary across those leagues: the NBA, MLB, IPL, Premier League, NHL, NFL, La Liga, Serie A, Bundesliga, Ligue 1, NPB (Japanese baseball), Chinese Super League, MLS, AFL (Aussie Rules), J.League, Scottish Premiership and Canadian Football League (gridiron). 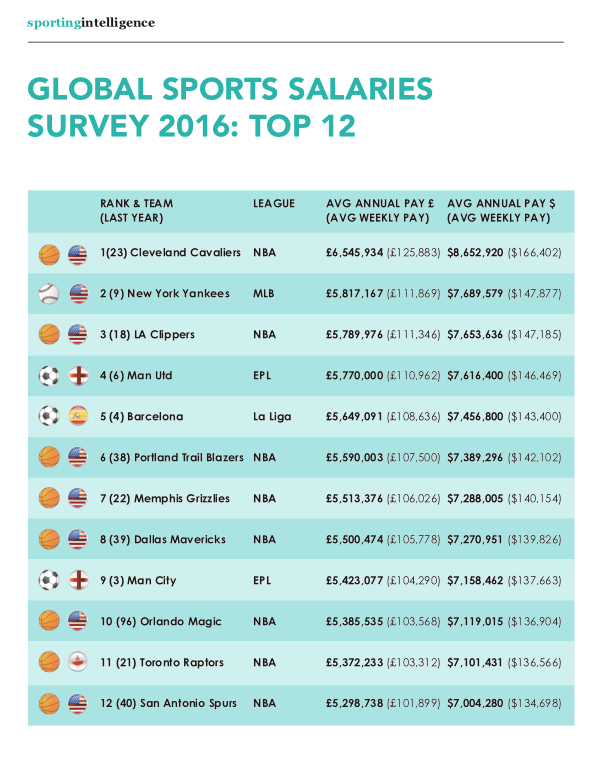 This is the seventh Sportingintelligence salaries survey and the starting point for the first one was to compare wages in the world’s most popular sports leagues.